The data and a close-up analysis of MLMs reveal that the losses are not random, as in Las Vegas. 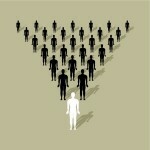 They are, as Mr. Thomas says, “systematic.” They are the calculated result of the pyramid scheme model. Dave Thornton, MLM whistle-blower in Canada was sued by the Canadian MLM, Treasure Traders, for daring to say in public that it was a pyramid scheme, not a legal and legitimate business. He won his case in court by showing the judge that his claim was reasonable, based on facts and on Canadian law. He did this by reducing the complexities of MLM pyramids to a simple question: Where does the promised profit to each participant come from? Like all MLMs, Treasure Traders (now closed down, but never prosecuted in Canada; it was prosecuted in England), offered rewards or “income.” To get the rewards, the scheme required each participant to make an initial or monthly investment in “purchases”. Then, all participants were told that if they just recruited a few other “salespeople” they could potentially earn millions of dollars. How could this be? What other sales company could offer all its salespeople millions in pay for making only a few sales personally? If it is not from the salesperson’s own sales or productivity, then, what about from the new salespeople he/she recruits. Not there either, since the salesperson only recruited a few others. These few were also promised the potential of huge incomes if they bought the product themselves and made just a few “sales.” Where would their income come from? It makes no difference in this model whether all the people put in cash or buy goods. The scam in not in the product or lack of a product. The flaw – and the fraud – is that the promise of “profit” is based entirely on “endless chain” recruitment. This is the “systematic flaw” referenced by Mr. Thomas. No chain can be “endless” and, if many, many new recruits must be in place for each one to make a profit, then, no matter how long the scheme operates, it will ALWAYS result in nearly all who ever join being in losing positions at the bottom. The 99% loss rate is built-in from the start, and fully understood by those who set up the scam. The promise of income in such a model is, therefore, unfair and deceptive. Only the ones at the very top will make money and these are the same ones that are making the promises to everyone else. Each time someone believes the promise and makes the “purchase”, those at the top make their money. And without a steady stream of new people “believing” (new people are always needed since financial losses cause most to stop believing within a year and quit the scheme forever) the money stream stops.